Most of the time, when Hollywood makes anything with a high school setting, they slap a laugh track on it. In contrast, many of Japan’s top animators consider young people’s formative years to be, you know, formative. You can see that respect in diverse films, like From Up on Poppy Hill, A Silent Voice, and Doukyusei—and it is all over the filmography of Makoto Shinkai. 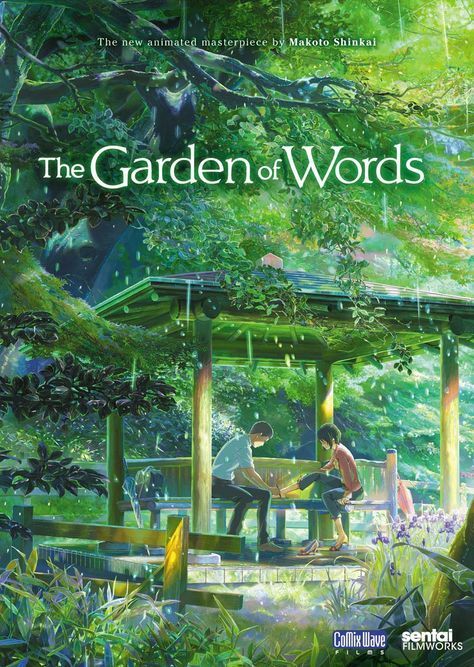 A characteristically sensitive but lonely high school student and a fragile adult make fleeting but significant connections in his long short film The Garden of Words, which screens as part of the Metrograph’s weekend Shinkai retrospective. Japan’s rainy season starts early, but that is just fine with Takao Akizuki. Whenever it rains, he skips first period to sketch in Shinjuku Gyoen, a Prospect Park-style garden retreat right in the midst of Tokyo’s legendarily intense business district. He enjoys sketching in the cool shelter of his favorite gazebo and he also starts to appreciate the company of Yukari Yukino, a pretty twenty-seven-year-old woman. Akizuki does not realize it, but he and Yukino are more connected than he initially understands. It is not that he is self-absorbed. Akizuki is a good kid, but he largely takes care of himself, because his older brother and mother are fly-by roommates at best. He also works multiple part-time jobs and spends what little spare time he might have studying fashion shoe-wear design. Frankly, his stolen moments with Yukino are the only time-outs he takes from being responsible beyond his years. As for Yukino, his earnest guilelessness provides a small measure of consolation as she recovers from a stress-induced breakdown. In terms of its beat-sheet outline, Shinkai’s narrative is quiet and simple, but the characters’ inner drama is exceedingly complex. You will not find anything remotely resembling cheap sentiment or cliched teaching moments in Words. Both Akizuki and Yukino will probably be working on their issues for the rest of their lives. By the way, that basically means their human, which is probably the only point Shinkai was trying to make. These are just compelling people that he invites viewers to come to know and understand better. 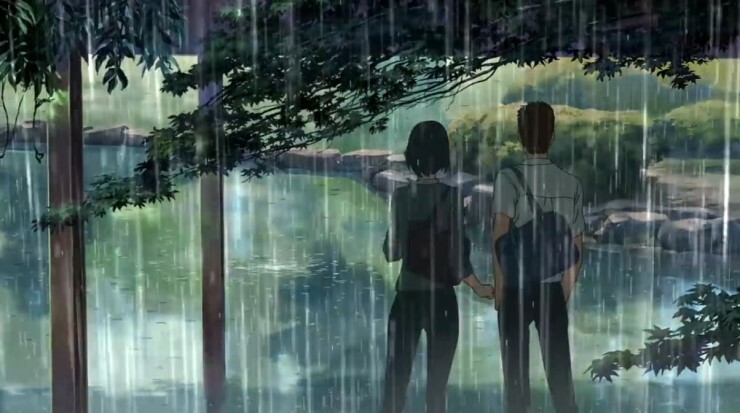 Words is a poignant film, even by Shinkai’s standards, but he really outdoes himself with the stunningly lush visuals. At times, his renderings of Shinjuku Gyoen are almost photo-realistic. The backdrops are so rich and verdant, you feel like you could just fall into them. It will definitely put you in the mood to cut work to stroll through Central Park, hopefully on a rainy day. You will be forgiven if you do not recognize Yukino from Your Name, but she does indeed have a small role to play in Shinkai’s blockbuster, so that definitely makes Words part of the Shinkaverse. Regardless, this is an unusually mature and emotionally bittersweet coming-of-age story. With a forty-six-minute running time, it is technically a short film, but it has had legitimate theatrical distribution, because it really is a work of cinematic art. Highly recommended, it screens as part of the short film program during the Metrograph’s Shikai retrospective.